In California's Sierra Nevada mountains, as more precipitation falls in the form of rain rather than snow, and the snowpack melts earlier in spring, it's important for water managers to know when and how much water will be available for urban and agricultural needs and for the environment in general. "We found that vegetation change may have a greater impact on the amount of stream flow in the Sierra than the direct effects of climate warming," said lead author Ryan Bart, a postdoctoral researcher at UCSB's Bren School of Environmental Science & Management. Bart co-wrote the paper with Bren professor Naomi Tague and fire ecologist Max Moritz, an associate at UCSB's National Center for Ecological Analysis and Synthesis. As the climate continues to warm and produce more severe droughts, fires and tree die-off events across the western United States, the potential for widespread vegetation-type conversion is becoming increasingly plausible. Wildfire is a particularly important factor. Exacerbated by climate and drought, fires such as the 2013 Rim Fire in Yosemite National Park can destroy entire stands of forest, which may not return. In some cases, they may be replaced by shrubs, raising the question of whether such a shift in vegetation type will leave more or less water in nearby streams. The findings were generated using the Regional Hydro-Ecological Simulation System (RHESSys), a spatially distributed model of which Tague is the primary architect. 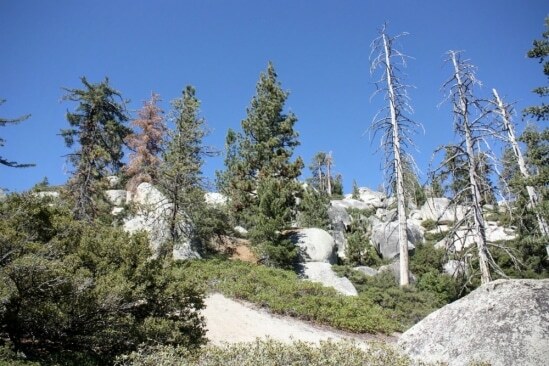 Because the future composition of shrub lands and the distribution of shrub species in the Sierra Nevada is unknown, the researchers examined stream flows under multiple possible scenarios of vegetation-type conversion in two Sierra Nevada watersheds. The team focused on the lower montane zone -- which ranges in altitude from 4,000 to 7,000 -- because the trailing, lower edge of many forests is likely to be the most susceptible to vegetation-type conversion. While some forest-to-shrub land conversion scenarios resulted in higher stream flow, depending on factors such as the size and area covered by shrub leaves relative to tree leaves, Bart noted that a shrub-dominated landscape would not necessarily result in more water in stream. "Intuitively, you might think that shrubs would use less water than trees because they're smaller, but field work from a related study has shown this isn't always true," he explained. "Shrubs are adept at pulling water out of the soil, so that in some cases, a decent-sized shrub may use just as much water as a much taller tree. It is only when shrubs are much smaller than trees that we see less water used by vegetation and thus more stream flow." The researchers also found that increases in stream flow would be observed only during wet years. "During very dry years, it doesn't matter what vegetation you have on a landscape, whether a tall tree or a small shrub," Bart said. "Each vegetation type will be able to exploit all the available water." The goal of the study was not to specify how much water will be available in the watersheds. "It's a small-scale study of just two watersheds, but it's the first to examine what might be the implication of vegetation-type conversion on stream flow in the Sierra Nevada," said Tague. "Our results show that the hydrology and ecology communities need to collaborate to understand how mountain landscapes will change 50 or a 100 years from now in the Sierra or elsewhere," Bart said. "The results underscore the importance of accounting for changes in vegetation communities to accurately characterize future stream flow for the Sierra Nevada."